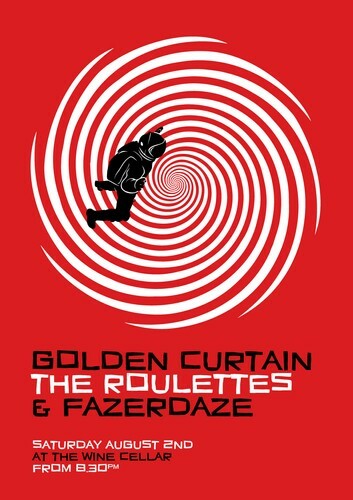 Two of our favourite bands – Golden Curtain and The Roulettes – will be joined by newcomers Fazerdaze at Auckland’s Wine Cellar on Saturday August 2nd – and for one of them, despite their impressive pedigree, it will be their first ever Auckland show. Golden Curtain are based in Napier – but they have quite the ‘Cosmocolitan’ history (the name of their label). They all come from great bands - Andrew McKenzie (Grand Prix), Andrew Gladstone (Garageland) and Brad Gamble (A Twin Moon). In fact, bassist Brad Gamble was named by US music blog Caught in the Carousel as one of the current “Eight Bass Players You Should Know About” – in the company of the bassists from Sierra, Elephant Stone, Peter Hook and the Light, Northern Arms, Camera Obscura, Lee Ranaldo and the Dust, and Palms. The Roulettes chuck in the best bits from 60s psychedelic beat-bands and Motown to now, adding some amped up riffery without sacrificing classic song structures… and pump it up to date in an explosion of swoony pop energy. And introducing… Fazerdaze Kiwi FM sensation, picked by Charlotte Ryan et al as most likely to succeed… new to the scene but fast becoming an indie fixture… following gigs with Beach Pigs and Anthony Tonnon, if you’ve not heard of her you most certainly will.